APC Mini LED Feedback. Hilfe! Hey ich bräuchte mal Hilfe. Wie so oft geht es um den LED Feedback. Wie schaffe ich es, dass mein Button in Farbe 1 leuchtet wenn er “aktiviert” ist und in Farbe 2 wenn er “deaktiviert” ist. Hi, I did a bit more work for another user on these a few months ago. Below is a project that I believe will achieve your desired results. I use the global variables g1 and g2 to control 64 lights. To save on global variables, I set them up to be a bit map of the buttons on your APC Mini. Each global variable uses 32 bits so I am able to achieve two states (on or off) using 2 global variables. I use bit manipulation to extract the current value. The work with toggling the button states is in preset APC Mini Light Control Translator Toggle Light with button. We extract the button’s current state, toggle it, then stuff it back into the global variable. When we are done, we do trigger a light refresh timer which iterates through all 64 lights putting them to their current state. This is done in the same preset under the translator “Light Refresh Timer”. We set the initial state of lights when the project is open or the ESC key on you computer keyboard is pressed. See the “Init” Preset. I know this might seem a little advanced, especially the bit mapping (extraction and stuffing) so feel free to ask more questions if you have them. If you want to control only a few lights then maybe bit mapping wouldn’t be needed because each light would take it’s own global variable. 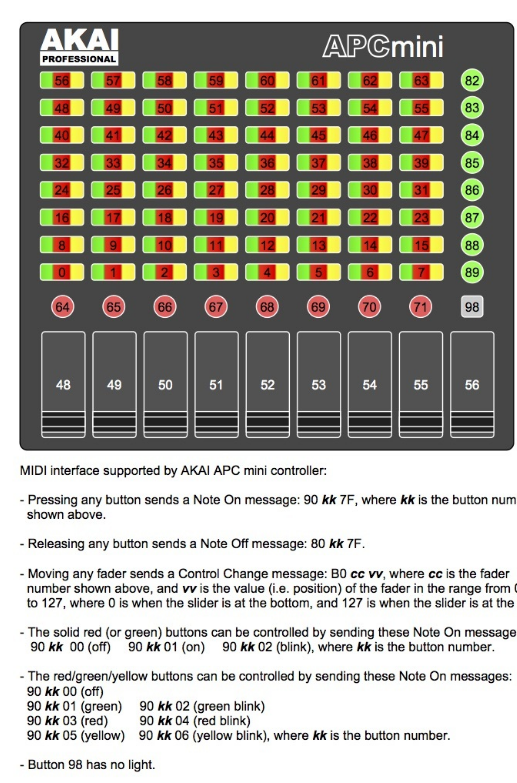 Attached is the more complex mapping using bitmap and the main 64 buttons of the APC Mini. I managed to map my APCmini to Dot2 onpc and all is working well I would love the lights to toggle as in your APC-Mini-Yellow-Green-Toggle but I don’t have a clue where to start. Can I copy this into my existing file or add it in some way? appreciate any advice. You should copy and paste the entire APC MINI Light control preset to your project. Also copy the entire Init preset over and then within the Set Global Variables translators, you can delete anything other than the lines that initialize up to variable gc . (which are the ones I used for MIDIBuddy). In this project I use global variables g1-g6 to manipulate the LEDs so make sure you are not using them anywhere else in your project. Make sure in the APC Mini Light control preset you have APC MINI as both input device and the only output device defined at the preset level. Under this scenario, if you change anything with Dot2, the LED’s will be out of sync with your APC MINI so be sure only to change things on the APC-MINI. If you also want to control the LED’s with Dot2, we will need to see what messages it sends back to the APC Mini. If it sends back good data, (note on for LED on and note off for LED on), then the LED feedback would not be necessary and we just need to put in translators with rules for Dot2 to control the LED’s. If this is the case, we would not need to track global variable state of the LED’s in MT Pro. If you struggle with all of this and need me to do it for you, please reach out to me via email and I can do this for a fee. Hey, I need help. How often is the LED feedback. How do I make it that my button in color 1 is lit when it is “activated” and in color 2 when it is “deactivated”. I found this on the APC40 which may be similar to the APC mini, but you should probably check the manual to see if there are any differences. Hope this will help. I will be creating a Youtube walkthrough series on how to map different type of LED adn Rings. Ring LED Just add + 8 to the current CC#. He wants to implement a toggle: each time a button is pressed, it toggles from green to yellow and vice versa.